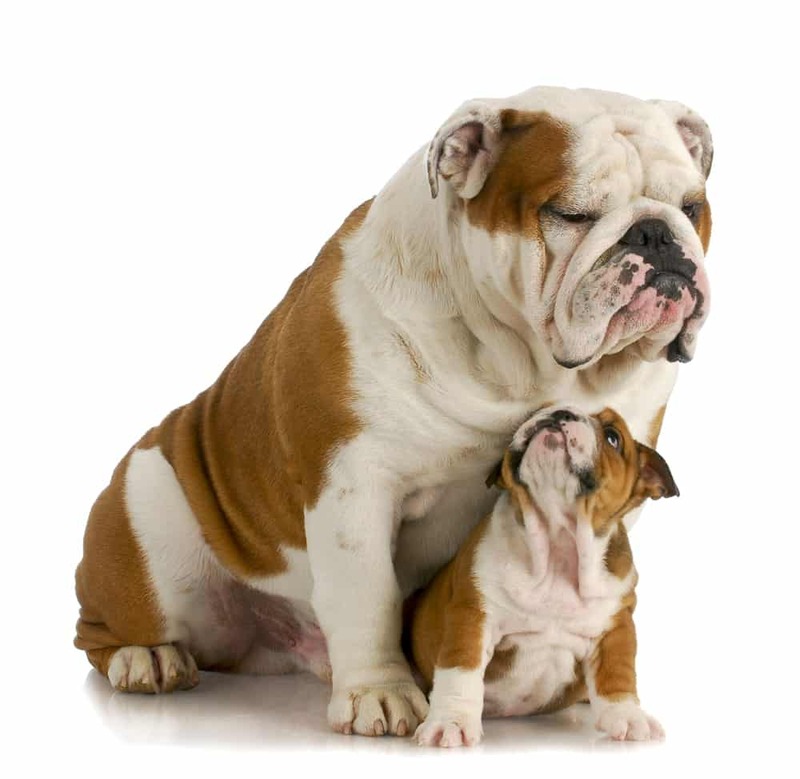 English Bulldog Price Tips - What's The True Cost of An English Bulldog? English Bulldog Price Tips – What’s The True Cost of An English Bulldog? The English Bulldog price tag is really just the beginning of the overall cost when you bring one of these wrinkly pups into your family. Like any breed, English Bulldog puppies have a unique set of needs that require your attention, some of which may come at an extra cost to you. 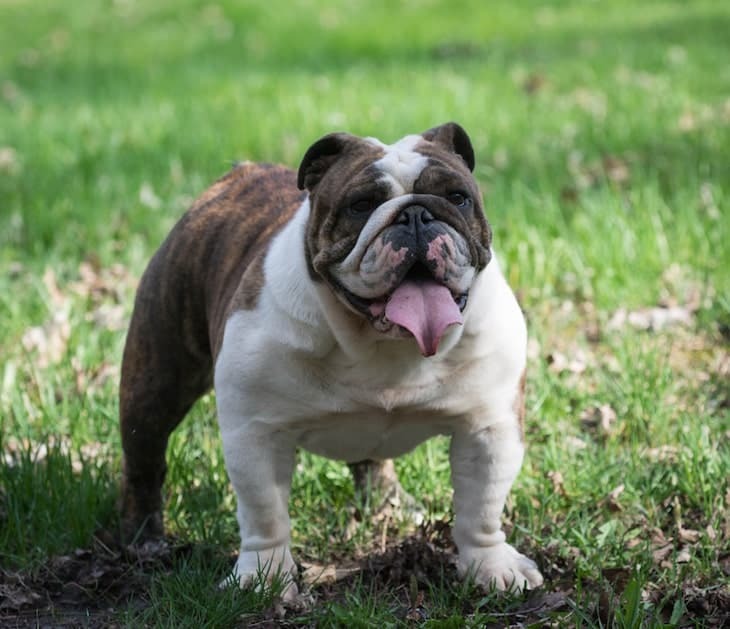 In this article, we’ll help you get to know the English Bulldog a little bit better so you can decide if it’s the right breed for you. We’ll discuss the breed’s temperament, and care needs as well as offer our tips on how to get the best English Bulldog price. It’s hard to believe that these friendly pups were initially bred to participate in a bloodsport like bullbaiting. English Bulldogs are one of the most docile breeds out there. They are devoted to their family members and have a calm, but playful nature. Sometimes called Old English Bulldogs, these pups have become popular for their cartoonish appearance and quirky personalities. It also helps that they are so easy to get along with! English Bulldogs don’t require a lot of exercises, though it is good for them. They would much rather lounge on the couch while awaiting their next meal. For this reason, they make great companions for individuals who have limited time or ability to walk them. So what will it cost you to bring one of these wrinkly bundles of joy home? English Bulldogs are one of the most expensive dog breeds out there, undoubtedly due to their popularity. 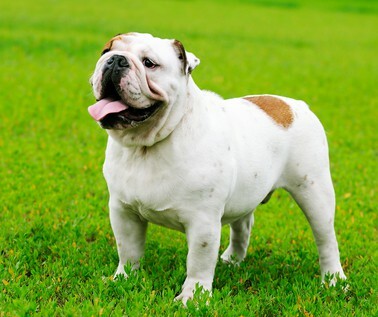 The average English Bulldog price falls somewhere between $2000 – $3000! Purchasing an English Bulldog puppy certainly requires deep pockets, but hey, you can’t choose who you love! When you start looking for an English Bulldog for sale, remember, your choice on which one to purchase shouldn’t come down to price alone. It’s important to look at the big picture when working to find your ideal furry friend. There are all kinds of different ways to encounter English Bulldog puppies (or adults)! You should weigh the pros and cons of each purchasing option to decide which is best for you and your family. 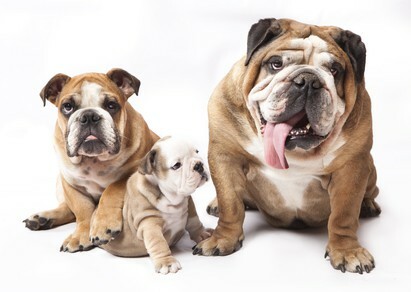 An English Bulldog breeder can be a great way to find the perfect pup for your family. Not all breeders are made equal though. So it’s important to do your homework and ensure that the one you work with is reputable. If you buy a pup from a careless breeder, your puppy could suffer from health problems. This can be very costly down the road. To ensure your breeder is looking after the best interests of his or her stock, request that they provide health clearances for their puppies. You should also ask to see where the puppies live, watch their interactions with the dogs, and meet your pup’s parents. This will help you ensure that the breeder treats their dogs well, and takes care to breed healthy stock. Dogs purchased from breeders tend to be on the more costly end of the price scale. The English bulldog average price from a breeder is sure to fall in the $2000 range. If the price is lower than that, beware, it could be a sign of a careless breeder. One of the advantages of purchasing from breeders is that you have a clear certificate of your puppy’s lineage and health history. This is especially important with English Bulldogs, as they are prone to numerous health issues. If you cringe at the thought of the $2000 purchase price of a purebred puppy, perhaps English Bulldog adoption is of interest to you. Adopting a dog is also a wonderful way to give an adult dog a new lease on life! Bulldog price for adoption is often around $300 but varies depending on the rescue. This price certainly seems like a bargain compared to that of a puppy from a breeder! Additionally, dog rescue organizations usually ensure that their adoptable dogs are up to date on vaccinations and spayed or neutered. With this in mind, adoption fees are a bargain! Of course, when you adopt an English Bulldog, sometimes it’s difficult to know your pup’s health history or anything at all about his origins. This may seem daunting, but rescues typically do try their best to get to know their dogs and place them with appropriate families. If you’re interested in adopting a bulldog, the Bulldog Rescue Club of America is a good place to begin your search. Despite being some of the most easy-going pups, bulldog breeds tend to have a higher cost of ownership than others. This inflated cost is largely due to the health problems that are commonly found in this breed. Many of the health issues that English Bulldogs experience are not life-threatening, but accommodating them can still cost a lot. English Bulldogs have a condition called Brachycephaly, which means they have a flat muzzle and an underbite. 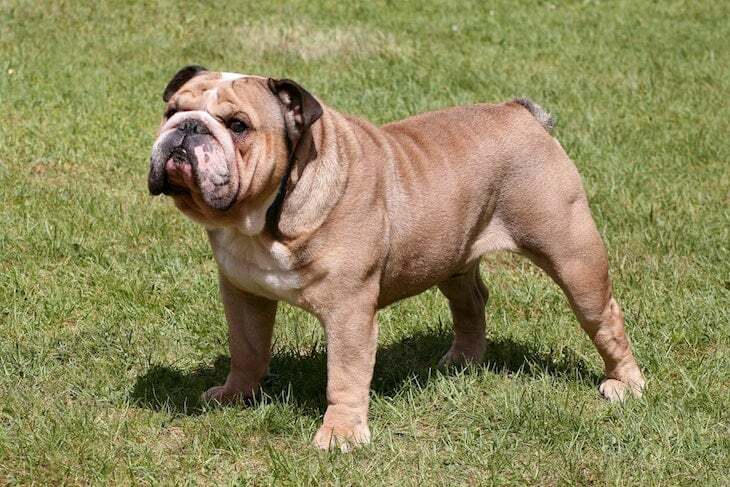 While their smushed faces are what endear them to many admirers of the breed, they do create health complications which can drastically affect English Bulldog price. Some bullies will suffer from Brachycephalic Syndrome which can result in difficulty breathing or even collapsed airways. The shape of their snout also means that these roly-poly puppies are highly susceptible to overheating in hot weather. English Bulldogs are also prone to obesity, which can cause joint problems such as Hip Dysplasia and Patellar Luxation. Also, because your Bulldog has a lot of teeth in a small jaw, he is more likely to have dental problems. It’s best to brush your bully’s teeth weekly and have them professionally cleaned by your veterinarian regularly as well. As you can see, many potential health issues can crop up with this breed. Some may require ongoing medication, or veterinary visits, which result in ongoing expenses for you. Because this breed is prone to so many health issues, purchasing pet insurance may be in your best interest. The monthly fee is likely worth the peace of mind you’ll have knowing you’ll be covered in case of any eventuality. 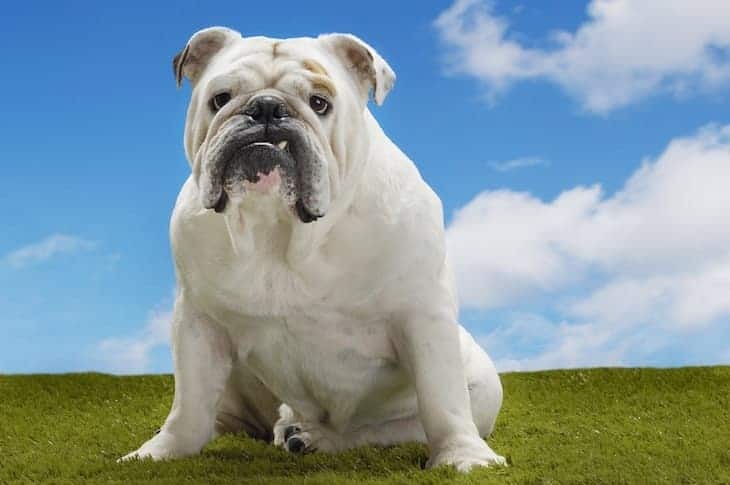 Is an English Bulldog the right dog for you? Before you start searching “English Bulldog puppies for sale,” make sure you consider the overall expense. Looking at the big picture is more important with this breed than just about any other, due to their propensity for health issues. These dogs really are easy-going, sedentary companions who are sure to amuse you with their comical expressions and quirky personalities. Just remember, the English Bulldog price comes with a lot of hidden fees.